We as 381 Buddhist Teachers in America represent a large community that is deeply concerned about the growing anti Muslim violence in Myanmar and across Asia, and the plight of the 1.3 million Rohingyas, many forced to live against their will in inhumane internment camps and permanent ghettoized communities. We know you have been supportive of all Burmese people and have encouraged peace and reconciliation across the nation. Your upcoming visit to Burma is an important opportunity to strengthen your capacity as a peacemaker. 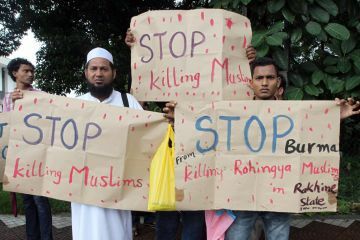 We urge you to once again express concern for Burma’s Muslims and Rohingyas in your public speeches and as well as in your diplomatic engagements there. We believe you can do so in a positive way, honoring the Burmese legacy of tolerance and Metta, values shared across all the great spiritual traditions, as nations including our own face challenges of injustice and prejudice. Thank you for your care in this matter that affects so many lives in Burma. Richard Brady, Mountains and Rivers Mindfulness Community. Ven. BodhinKjolhede, Abbot, Rochester Zen Center, Rochester, New York. Lorne Ladner, PhD. Guhyasamaja Buddhist Center. Jennifer Stanley, Insight Meditation Community of Washington, Washington, D.C.
Ellen Furnari, PhD, BuddhistPathways Prison Project, Solano prison, Vacaville, CA. te necesito a ti que lo haces latir.